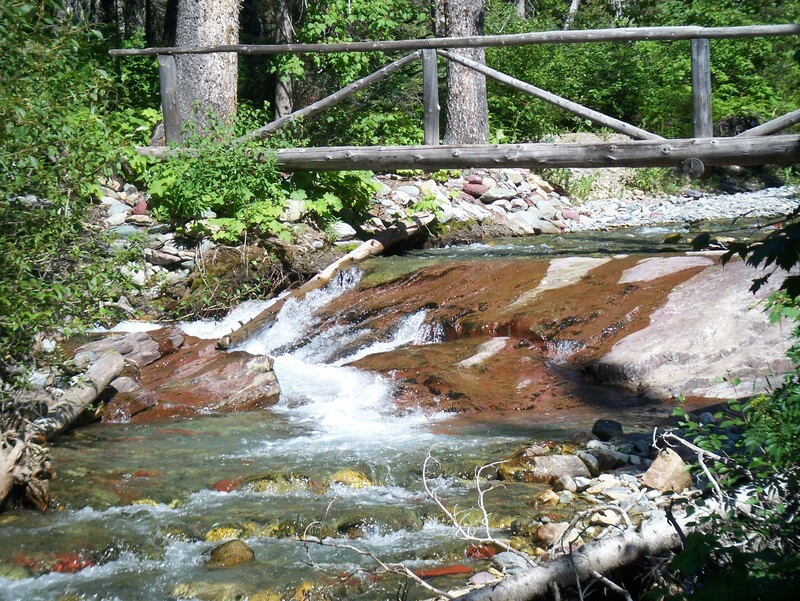 We are back from day 2 of our Waterton Lakes National Park adventures. 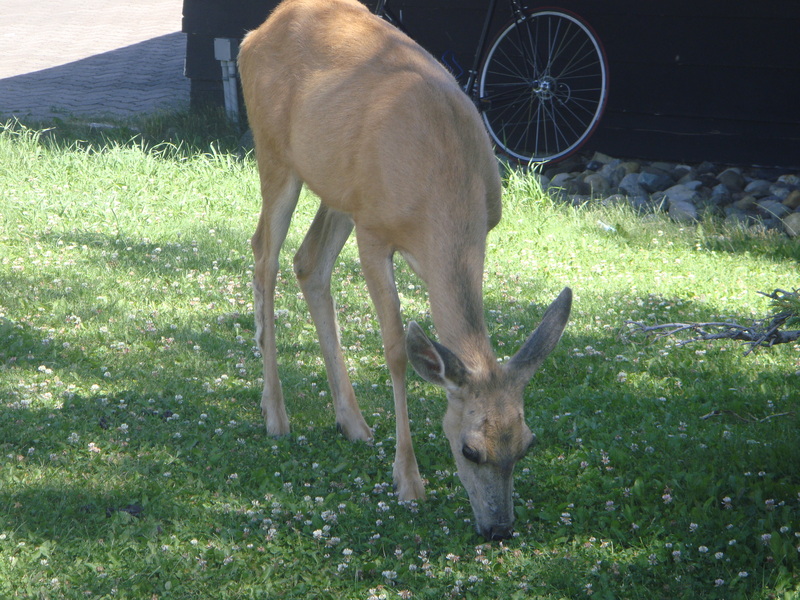 Yesterday, I commented on International Peace Park that within reason animals are right there and pose for you. We were unable to post our one bear sighting. Despite poor vision, bears hear very well our sighting was from the boat. 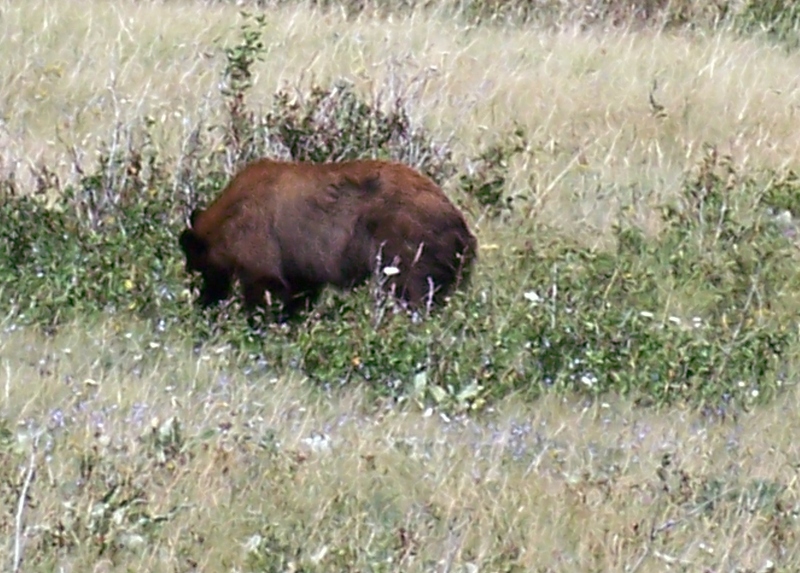 As we moved closer, the bear heard us and headed for cover. We only took pictures of his rear end from a distance. Today we had two bear sightings. This was our first sighting. 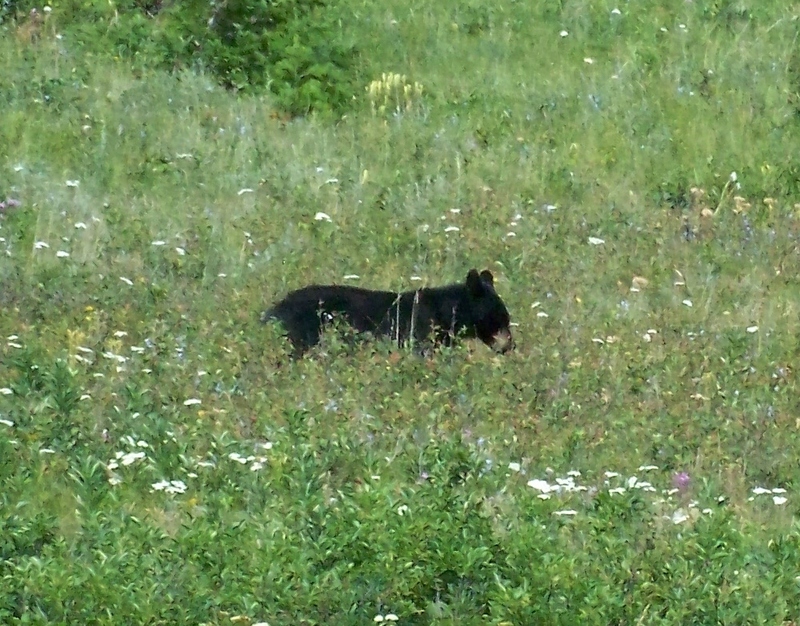 This bear was about 100 metres away on a hillside as we left town. 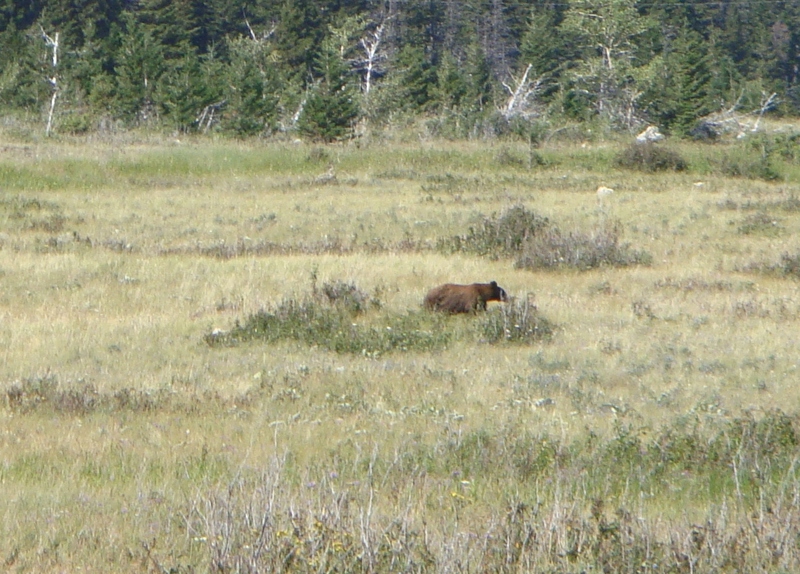 It is a fair-sized and is brown, but is likely a black bear and not a grizzly. What we could see of the snout and head does not look quite right and it is missing the hump on the back. Here is another view. Grizzly bear are generally solitary and do not like humans around them where black bear are more likely to approach areas with humans around. 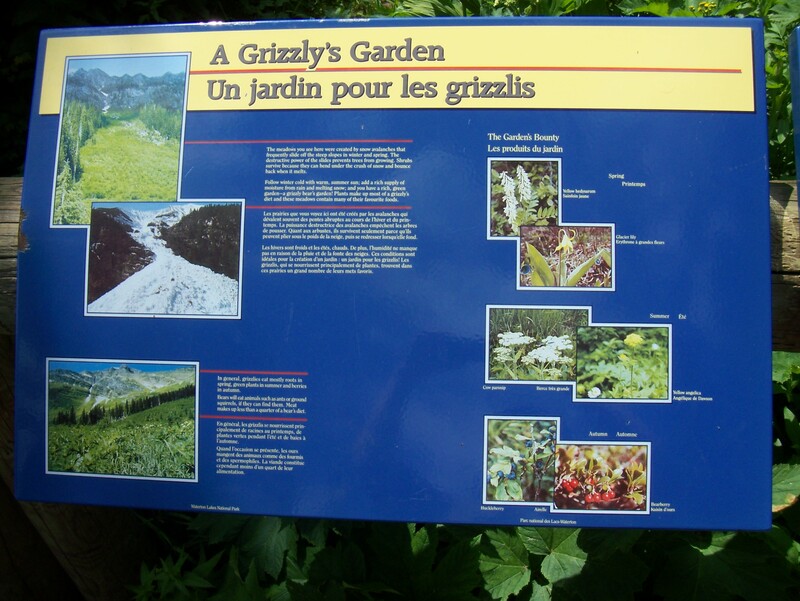 This sign is at the Cameron Lake trail and refers to the area beyond as a ‘grizzly’s garden’ and care is needed beyond this point. Here is a haiku for grizzly bear we did not see, but we know is out there. Our good fortune was not done. 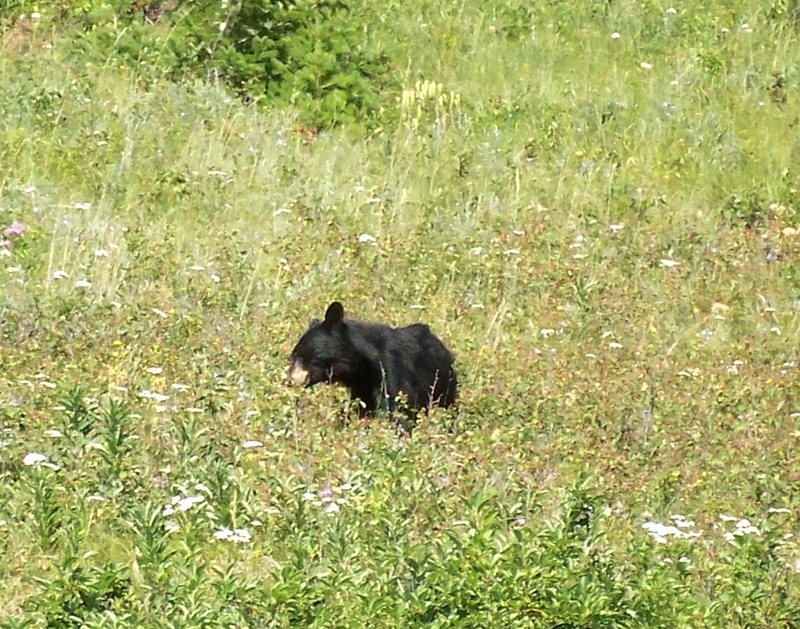 We spotted another black bear on another hillside on our way back from Red Rock Canyon. This one is younger and smaller and is definitely a black bear. I would guess it was born a year ago this past spring. You can see the snout and the ‘piggy eyes’ of the bear. They are members of the same family as the pig. The ears stick up more and the grizzly would have ears that are ‘teddy bear like’ and stick out from the side of a very large head. Not all animals we met were as intimidating. This sheep was about 2 metres from the car and just looked up to have its picture taken. 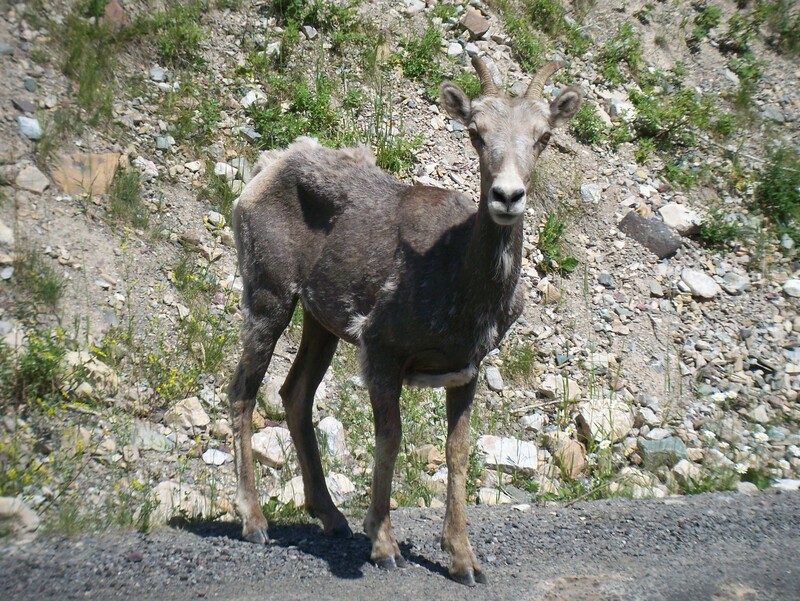 Posted in Haiku, Nature in All Its Glory, Photography, Poetry, Uncategorized and tagged haiku, nature, poetry, Rocky Mountains, waterton lakes national park. Bookmark the permalink. 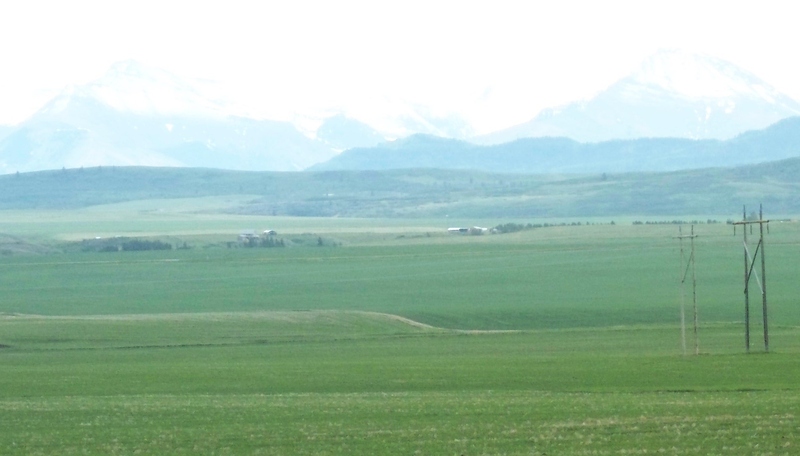 Kathy and I wanted to travel down to Glacier National Park, Montana, but the logistics were challenging. We put this on the back burner this year and traveled to Waterton Lakes National Park in the southwest corner of Alberta. The two parks combine and form the first International Peace Park and are often called the Crown of the Continent, but there is no easy way to see both without a lot of traveling or so we thought. Luck intervened and we found our way down to Glacier National Park. In national parks you can get up close and personal with the wildlife. They are still wild and skittish, but as long as you are careful they stay and. I took this picture just outside the ticket offices for the boat tours. She grazed, let several of us take pictures, and we were within a couple of metres (five or six feet) of her. Oh my dear, it’s a deer. We were able to travel to Glacier via an alternate mode of transportation: a boat. 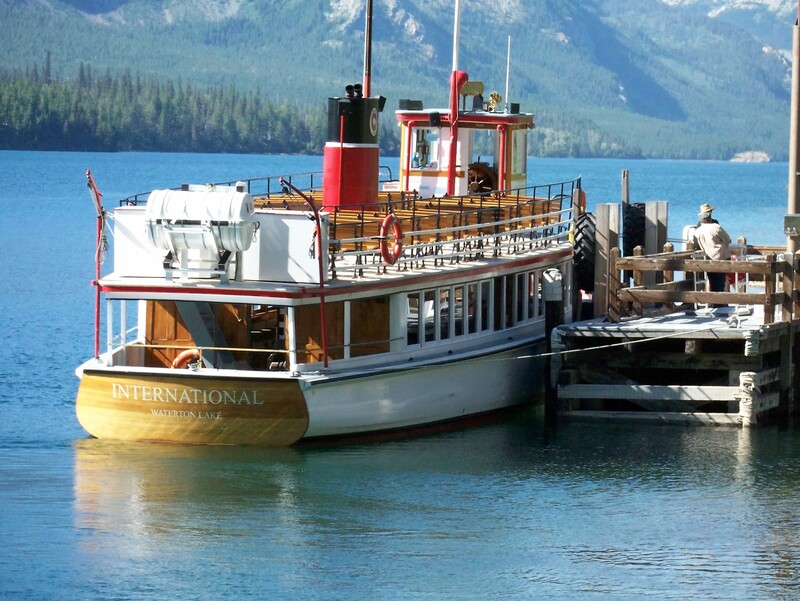 This is the US International, an 85-year-old boat, that makes four round trips on Waterton Lake to the south end. Part way through the trip, we crossed into the US and Kathy and I chose to stay for a couple of hours to do some hiking. 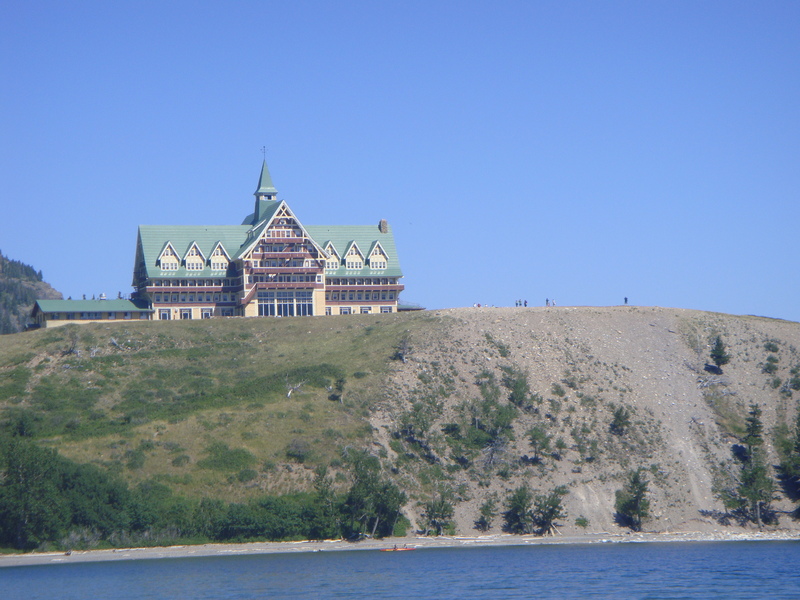 An icon of Waterton is the Prince of Wales Hotel. It was built in 1927 and overlooks the lake. It is open from mid-June until mid-September. We have missed it on other trips due to traveling in the off-season, but this year we are stopping for ‘high tea.’ This is a view from the boat. When Kathy and I got to the US port of entry at Goat’s Haunt, we stayed and hiked into a small alpine lake called Kootenai. It is about an 8 km walk (5 miles) and took about 2.5 hours. 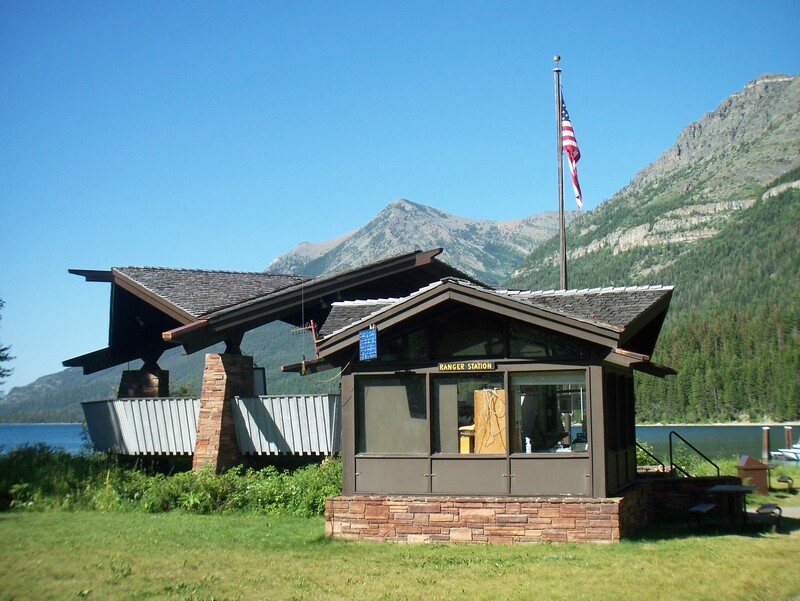 This is the ranger station and border crossing. We showed passports and answered routine questions. This is a view from the path along the way. This was a small stream we passed over twice. The flow of water has worn the rock flat. Nature is rich with paradox. We are off for another day of adventure. 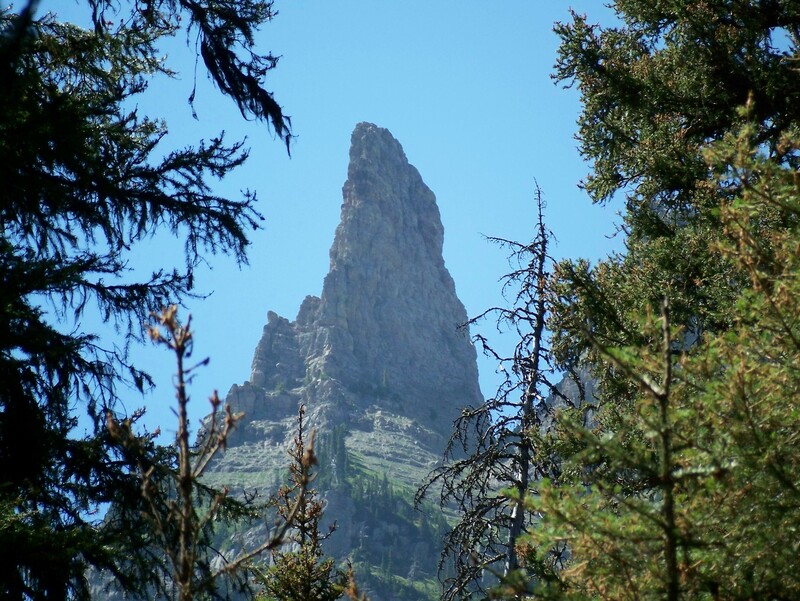 Posted in Haiku, Mindful Life, Nature in All Its Glory, Photography, Poetry, Reflective Moments and tagged Glacier National Park, glacier national park montana, international peace park, Mindful Practice, poetry, Rocky Mountains, sabbath, teacher as transformer, waterton lakes national park. Bookmark the permalink. Kathy and I head home after a great month in Spokane and at Gonzaga. I enjoy my time here and find the “pause that refreshes.” Part of this is paying forward which happens and the flow of time within this relational space. I see paying forward as a circle. Yesterday, we said good-bye to a colleague on his way home. He reminded me I lent him one of my papers his first summer here and how much that meant to him at a time he was ready to pack it in. I told him my first experience here was similar and someone reached out to me. I find the same thing in virtual community. It is harder to carry on conversations and build relationships, but I find a qualities that are unmistakeably human: care, reciprocity, and trust. I am grateful for the daily support I receive in each form of relationship. I found this quote at Circle Toward Wholeness and it speaks to the circular nature of life and how gifts are constantly received and returned. The quote can also be found at Unitarian Universalist and Circle Fellowship in a more linear form. Posted in Community, Mindful Life, Poetry, Reflective Moments and tagged Black Elk, blogging, community, haiku, Mindful Practice, Parker Palmer, poetry. Bookmark the permalink. 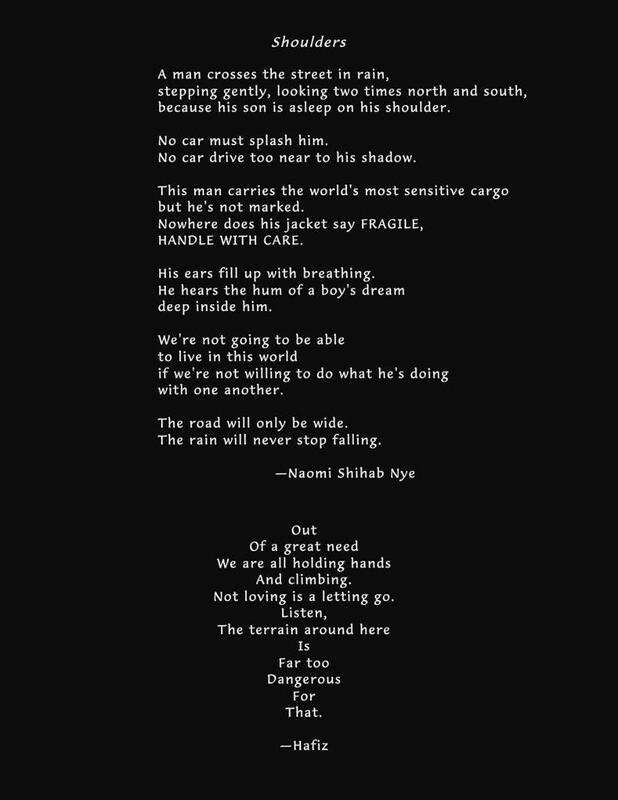 I mentioned when I posted Angry Young Poet there was a second poem I shared from my youth with my students. I softened this one a bit, as it had an angry voice. I know this version sounds pretty harsh, but it is gentler. A recent conversation reminded me how I marginalize voices of those already marginalized. A professor commented he was told by an affluent person that another less fortunate person was a non-entity and the worth of human was measured in material worth. I know this might be isolated, but it troubling and I was reminded of this poem. Posted in Lesson Plans, Poetry, Uncategorized, Writing and tagged poetry, teacher as transformer. Bookmark the permalink. Before I post, I wanted to acknowledge inspiration is reciprocal. Each day, with anticipation, I check my email and follow blogs I subscribe to. 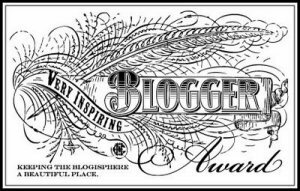 I have gained a considerable amount from blogging, but is humbling. When I began, I had few visitors, no likes, and no comments. Gradually, this changed and blogging became rewarding in and of itself as I learned its nuanced context. It is still humbling in two ways. First, when I check creative blogs posted about passions people hold dear, it impresses me with the process and product. Second, I keep it real . Statistically, the blog I follow with the largest following has about 15, 000 followers. This is about 0.000002% of the world’s population and my 300 followers is about 0.00000004%. Against the odds we form a small, appreciative community and share parts of our lives. Thank you. I have a fairly large (ice) hockey memorabilia collection. I was a banker before becoming a teacher. I was a single digit handicap golfer before my car accident. I have never seen the Atlantic Ocean live. I am a Montreal Canadiens (ice) hockey fan. Posted in Blogging, Community, Reflective Moments, Writing and tagged awards, blogging, community, creativity, teacher as transformer, writing. Bookmark the permalink.